Heartland FC bags Dana Air sponsorship for 2017/2018 NPFL. – Royal Times of Nigeria. 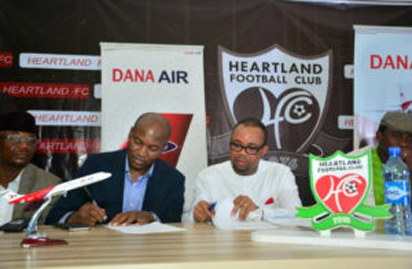 Heartland FC bags Dana Air sponsorship for 2017/2018 NPFL. Heartland FC of Owerri have bagged a multi-million naira sponsorship with Nigerian carrier, Dana Air, which are also the operators of Imo Air. The season-long sponsorship deal which is part of the airlines’ support to the newly-promoted Imo-based team’s 2018 league campaign, will see the airline get shirt sleeve branding and lots of other branding opportunities with the club. The airline confirmed the development in a statement on Monday in Lagos by its Communications Manager, Mr Kingsley Ezenwa. The statement quoted the Accountable Manager of Dana Air, Mr Obi Mbanuzuo, as saying at the unveiling in Owerri, the Imo capital, that football was big business and had become one of the most unifying factors in the world. “At Dana Air, we are committed to supporting our own. We are also committed to youth and sports development in Imo and in Nigeria at large. “There is need to look inwards, so we can build our league and the teams to make them more attractive and glamorous. We have taken the lead and we hope that other corporate bodies will follow,’’it said. The statement said that in coming up with the sponsorship, the airline looked at how the team performed last season, their promotion to the upper division and determination to make the people of the state proud. “We believe that our sponsorship will bring the much-needed boost, confidence and motivation to go for the league title this season. “Under this sponsorship package, the player of the month will get a whopping cash gift as part of efforts to motivate the players to do better, keep fit and continuously improve themselves to get the prize,’’ it quoted Mbanuzuo as saying. Commenting on the deal, the Imo Commissioner for Sports, Dr Martins Ohiri, thanked Dana Air and the state government for the partnership that had culminated in the deal. Also, the Chairman of Heartland, Mr Goodfaith Etuemena, assured the airline of commensurate mileage on the sponsorship. “I am glad that my search for sponsors is finally paying dividends. Hopefully, this partnership would attract more. “Heartland is a big brand and we promise to repay the confidence that your company has bestowed on our legendary club,’’ he said. Dana Air had in 2017 entered into an airline partnership with the Imo Government.